Why would I need self storage in West Chester, PA? There are a variety of reasons why you might need self-storage in West Chester, PA.
How much is a storage unit in West Chester, PA? The cheapest storage unit in West Chester, PA is $39.00 per month. What size storage units do you have available in West Chester, PA? In West Chester, PA we have sizes that range from 5'x5' to 15'x20' to suit your storage needs. How much is it for a 5'x5' storage unit in West Chester, PA? The cheapest 5'x5' storage unit in West Chester, PA is $39.00 per month. West Chester is a growing borough in Pennsylvania's Chester County. It's about an hour from Philadelphia, putting plenty of options for entertainment, shopping and dining within easy reach. The community is home to many historical points of interest as well as modern amenities, making it a desirable place to settle down. The area that's now West Chester was once fishing and hunting territory for the tribal clans of the land. In the mid-1600s, Dutch and Swedish settlers came to the area and began building settlements. While West Chester became its own city in the 1700s, it started out as part of the city of Goshen. Originally, the community was called Turk's Head, named after a local tavern located near the present-day center of town. Throughout the 18th century, it was a hub for the clockmaking industry, later progressing to the manufacturing of wheels. 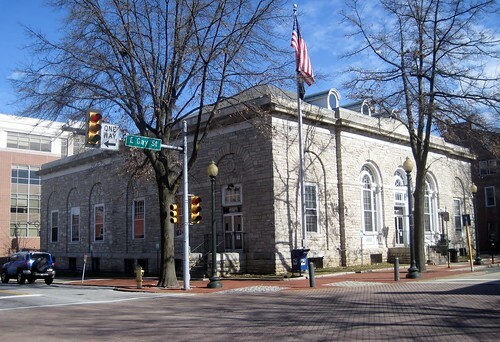 West Chester became the county seat of Chester County in 1786 and was incorporated as its own borough in 1799. West Chester offers a low crime rate, distinct seasons with mild summers and a healthy economy. Many young professionals are choosing the borough as their home base, especially because it provides convenient access to Philadelphia. You'll be able to enjoy a number of amenities in West Chester, ranging from everyday conveniences like grocery stores, coffee shops and restaurants to recreational facilities and special events. The borough organizes regular community trips to major attractions in the region, including Washington, D.C.'s Cherry Blossom Festival, New York's Radio City Music Hall and more. A number of West Chester parks provide scenic green places to relax, and local parks and recreation programs offer options for adults, children and seniors. Students who live in West Chester are enrolled in schools that are part of West Chester Area School District. The district serves a 75-square-mile radius, including the towns of West Chester, East Bradford and West Goshen and other small communities. West Chester and the surrounding area provide many options for private education, including both parochial and secular campuses. Utilities: West Chester's primary utilities providers include PECO and Aqua America. Garbage and Recycling: The borough is divided into four quadrants for trash and recycling collection, with each quadrant assigned a specific pickup day. Transportation: Several SEPTA bus routes operate through West Chester and the surrounding area. Homes in West Chester are priced well above the national average, and continue to rise on a steady basis. The market features a wide variety of options, ranging from compact townhomes to large detached homes on spacious lots. There are also many rental options in West Chester, including many modern apartment communities that feature amenities like resort-style pools, gyms and social activities. Our lowest priced units in West Chester, PA average $39.00 per month. 86 people have reserved units in West Chester, PA in the past 30 days. There is 1 location within West Chester, PA's city limits.